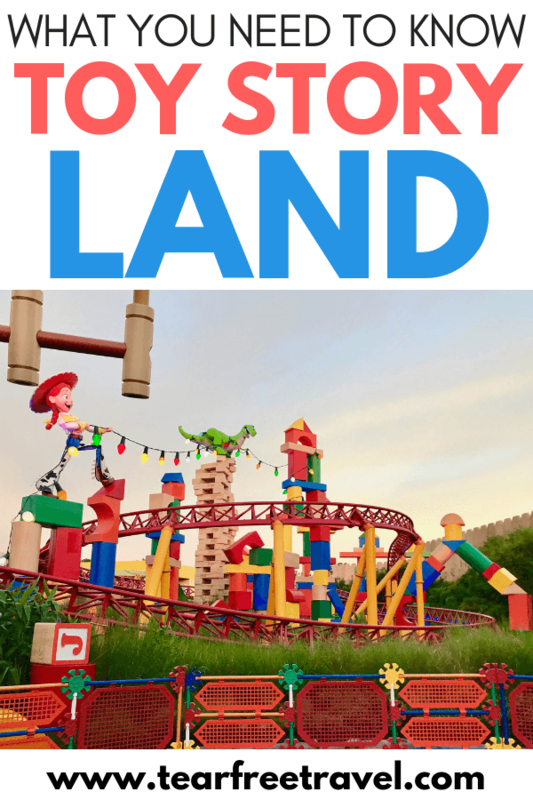 Toy Story Land opened the summer of 2018, and trust me when I say, it’s so worth going! When you step into Toy Story Land it will take you back to Andy’s house and make you feel like you’re in the movie! Before you go, there are a few things you want to know first. These tips are going to help you save time, money, and your sanity while you are visiting Toy Story Land in Disney’s Hollywood Studios. If you are going to choose one of these rides to FastPass, I highly recommend you choose Slinky Dog Dash. The wait time for this ride rarely drops below 180 minutes! Slinky Dog Dash adds another fantastic roller coaster experience to the Disney’s Hollywood Studios park! This family-friendly roller coaster takes up a huge portion of Toy Story Land through curves, hills, and drops. Alien Swirling Saucers will likely remind you of the teacup ride in the Magic Kingdom because it’s a similar ride. Toy Story Mania works similar to the Buzz Lightyear version in Magic Kingdom, but there are differences. Toy Story Mania has riders participating in 3D carnival games. If you’re heading to Toy Story Land, be prepared for some waiting in line. The is one of the most popular new areas in Disney World. Luckily, there are ways you can beat the wait at Toy Story Land! The first is by getting a FastPass for the rides you are interested in. Learn about Fastpasses here! Of course, FastPasses for these attractions are likely to be out pretty quickly. If you’re staying at a Disney World resort, you’ll have the advantage of earlier FastPass selection for the best chances of getting on your favorite rides. On our first trip to Toy Story Land, we were too late to get a FastPass to Slinky Dog Dash. Instead, we purchased early morning magic at Toy Story Land. Although this does cost extra, this was the best money that I spent at the park! We could have easily rode every single ride in Toy Story Land twice. We waited less than 5 minutes for Slinky Dog Dash. Early Morning Magic does come with buffet breakfast as well. Meet Buzz, Woody, Jessie, and more! There are a ton of characters around Toy Story Land that would be hard to find anywhere else! You have the unique opportunity to meet Woody, Jessie, and Buzz Lightyear while in this section of the park. You will occasionally see Green Army Men from the movie walking around, performing, and they even host their own Green Army Patrol show. Check out our guide to the best ever Disney World Resort stay! This quick service dining location is located right in the heart of Toy Story Land. This dining location is quick service, and seating is outside only. There are umbrellas on most tables, however, there is no indoor seating available. There are four entree options for both breakfast and lunch/dinner. While this quick service dining location might rack up $10 or more per person in food, it is delicious! A note about Woody’s Lunchbox that you will want to prepare for is that seating is REALLY limited. If possible, have your spouse or someone grab a table while you stand in line. Check out our guide to the best snacks at Hollywood Studios. There’s plety to suit your sweet tooth at this park! If you are planning on visiting Toy Story Land while you’re in Disney’s Hollywood Studios, go early! You will want a FastPass for Slinky Dog Dash, and you may be able to hop onto Toy Story Mania and Alien Swirling Saucers for an hour or less if you go early. The wait times for these rides will only go up throughout the day! 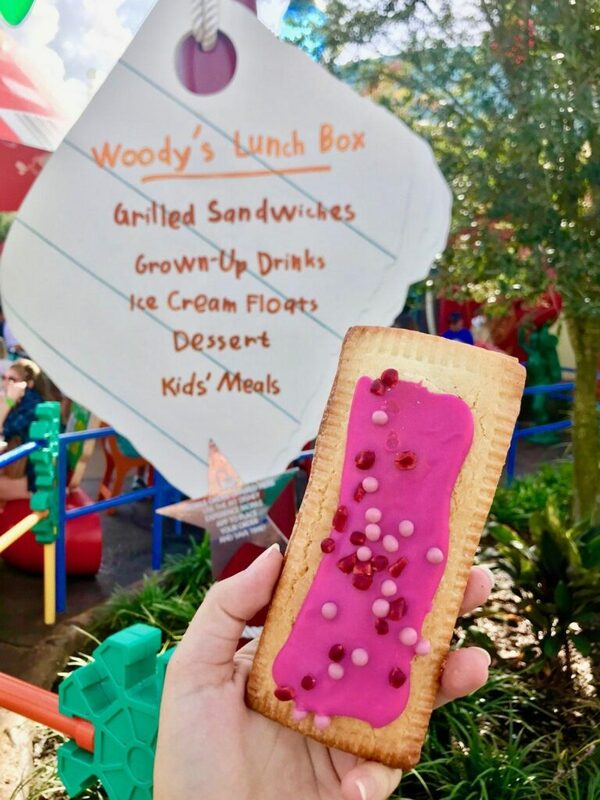 If you are considering dining at Woody’s Lunchbox, be prepared to scoop up a table as soon as you see one available. I have seen people fight over seating before, and you don’t want to end up having to eat standing. Whether you are planning your trip to Toy Story Land or planning a return trip, I hope these tips have helped you make the most of your time there!